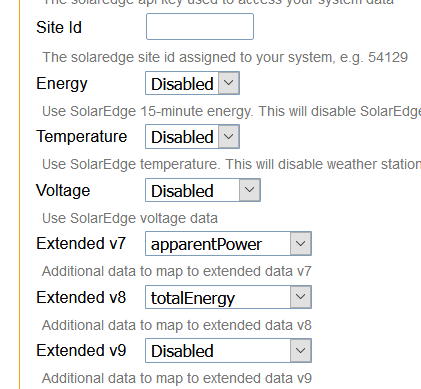 As a SolarEdge user, it’d be cool if the Extended Data section could be utilised and/or customised for showing/logging extra data that is available via the API. Perhaps when using Automatic Uploads there could be an option exposed for Extended Data where one can choose from drop-downs, the available fields from the given API to put onto the Extended Data page. e.g. 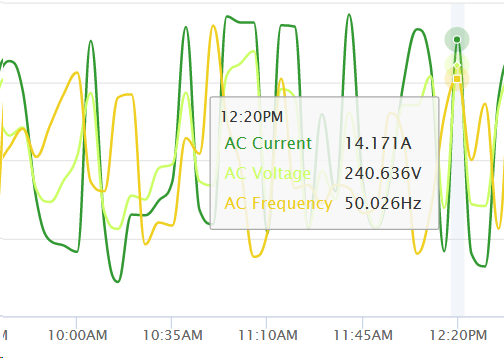 DC Voltage, AC Voltages on diff phases, Reactive Power, Inverter temp, etc. whatever other values might be useful. Probably a good Donation feature. Extended parameters v7, v8 and v9 are now available for the SolarEdge Auto Uploader. Note the Energy setting above must be Disabled for this work. Edit: Just tried this out, it doesn’t look like it’s populating with data. Someone else I know has also tried it and it’s not populating with data for them either. The L1 isn’t available for the system. Tried that, still doesn’t work. That’s why I tried L1. Sorry, it was a bug but fixed now. what API string is used for this great feature? As it looks like the values I get in PVOutput are already rounded numbers even before I apply the Decimals setting in the Extended Data. Currently the Auto Uploader rounds extended values to 1 decimal, but will be updated to a max of 4 decimals on the next enhancement update. Extended data decimals values saved by the Auto Uploader are now rounded to 3 decimal places. Is it possible that all the Extended parameters (v7-v12) be available for SolarEdge Auto Uploader? I used to have WU Temp stored in v11. Since WU API is no longer available, I would like to use v11 for this. Its already available for v7-v9. v10-v12 will be added in the future. But it looks like I do see the extended data on the day itself, but on previous days there is no data anymore, did I change something? All looks to be default. I figured out that when I’m logout all the extended data is shown, but when I login only the current day is shown and not all previous days, so something goes wrong with public/privat? so something goes wrong with public/privat? This has been fixed now, refresh the page to see extended data while logged in. Works now, many thanks again!